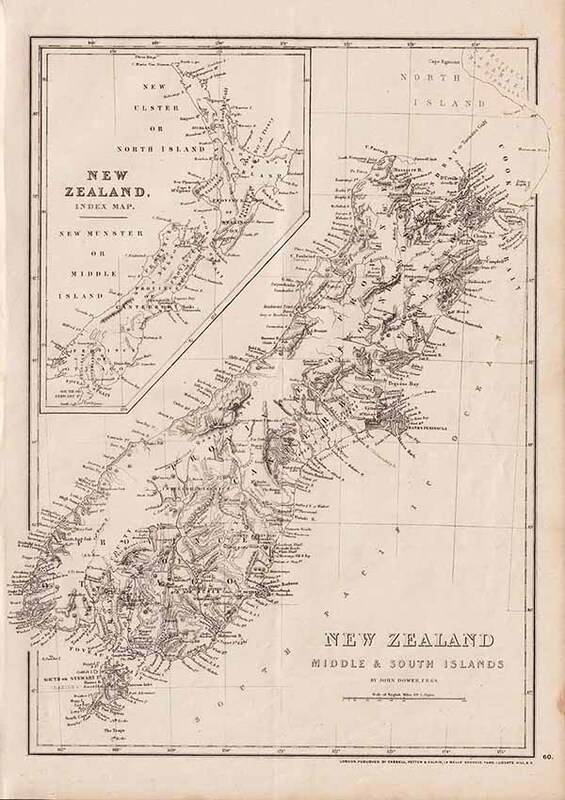 New Zealand Middle and South Islands - John Dower. F.R.G.S. 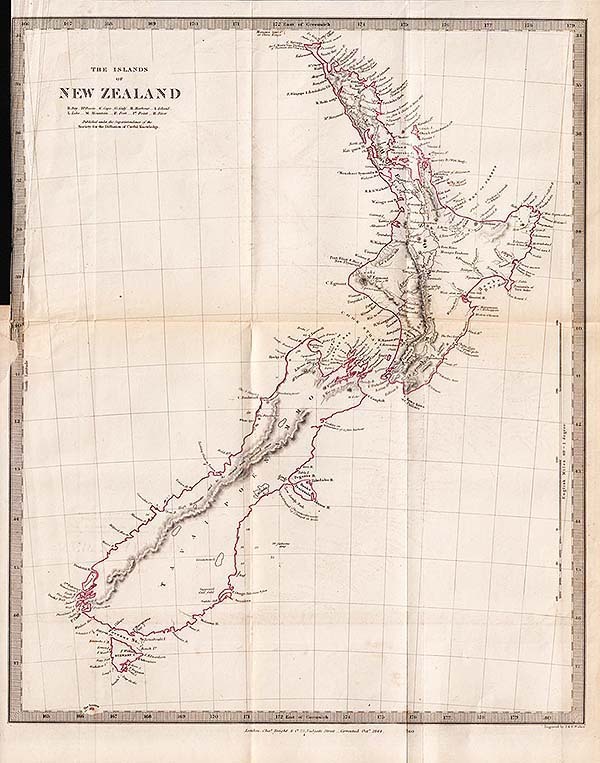 An antique map of New Zealand Middle and South Islands by John Dower. London Published by Cassell, Petter & Galpin, La Belle Sauvage Yard, Ludgate Hill, E.C in "Cassell's General Atlas...". Circa 1870. 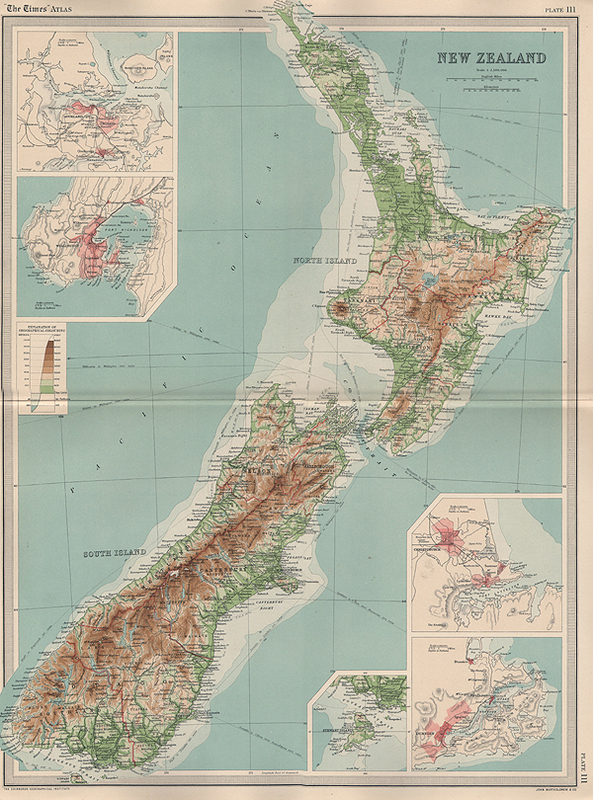 Inset Index Map of New Zealand top left. New Zealand North Island. John Dower. F.R.G.S. 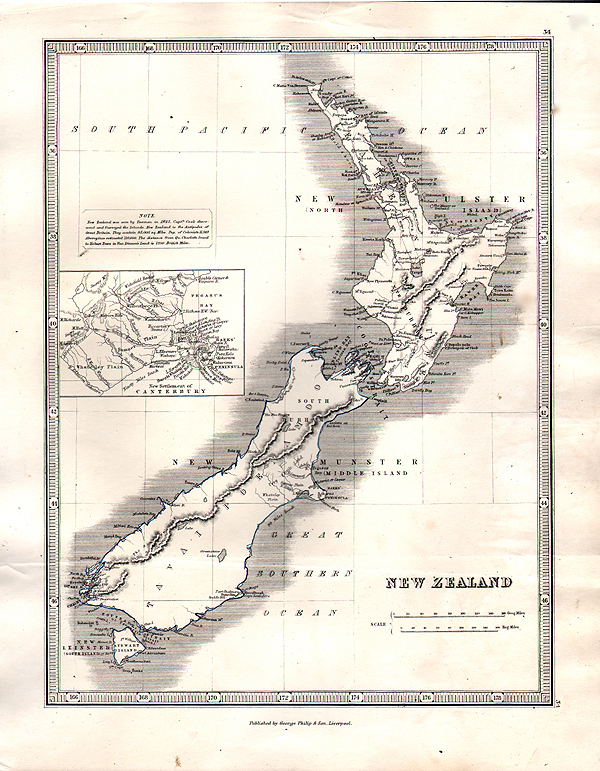 An antique map of New Zealand North Island New Ulster or Eahein O Mauwe by John Dower. London Published by Cassell, Petter & Galpin, La Belle Sauvage Yard, Ludgate Hill, E.C in "Cassell's General Atlas...". Circa 1870. 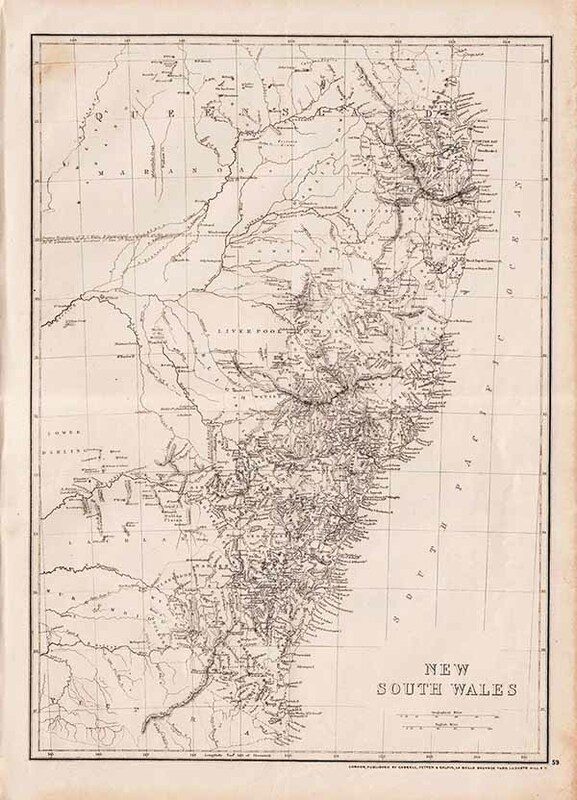 An antique map of New South Wales. London Published by Cassell, Petter & Galpin, La Belle Sauvage Yard, Ludgate Hill, E.C in "Cassell's General Atlas...". Circa 1870. Victoria (Australia) by Edward Weller. F.R.G.S. 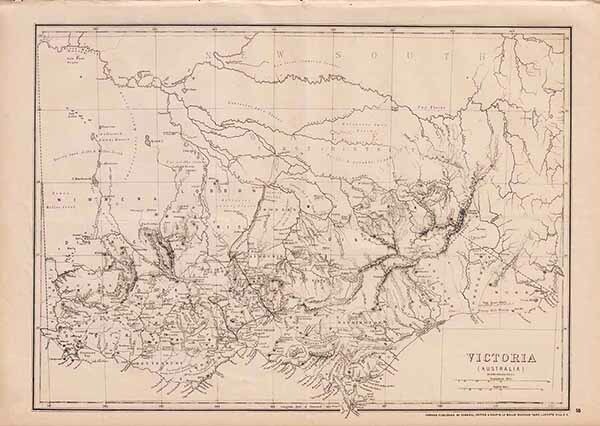 An antique map of Victoria (Australia) by Edward Weller. London Published by Cassell, Petter & Galpin, La Belle Sauvage Yard, Ludgate Hill, E.C in "Cassell's General Atlas...". Circa 1870. Colony of Queensland (Australia) by Edward Weller. F.R.G.S. An antique map of Queensland, Australia by Edward Weller, London Published by Cassell, Petter & Galpin, La Belle Sauvage Yard, Ludgate Hill, E.C in "Cassell's General Atlas...". Circa 1870. 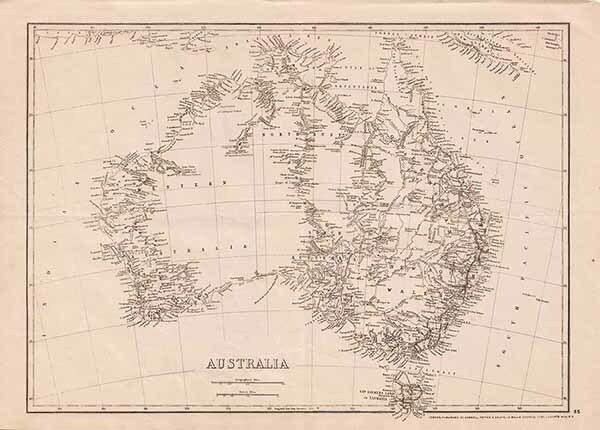 An antique map of Australia., London Published by Cassell, Petter & Galpin, La Belle Sauvage Yard, Ludgate Hill, E.C in "Cassell's General Atlas...". Circa 1870. Queensland. 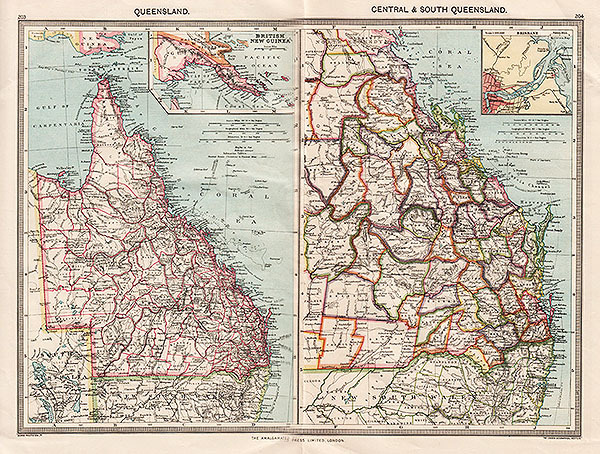 Central & South Queensland. An antique maps by George Philip & Son, which was published in 'The Harmsworth Universal Atlas' by The Amalgamated Press, London, Circa 1900. An antique map by George Philip & Son, which was published in 'The Harmsworth Universal Atlas' by The Amalgamated Press, London, Circa 1900. 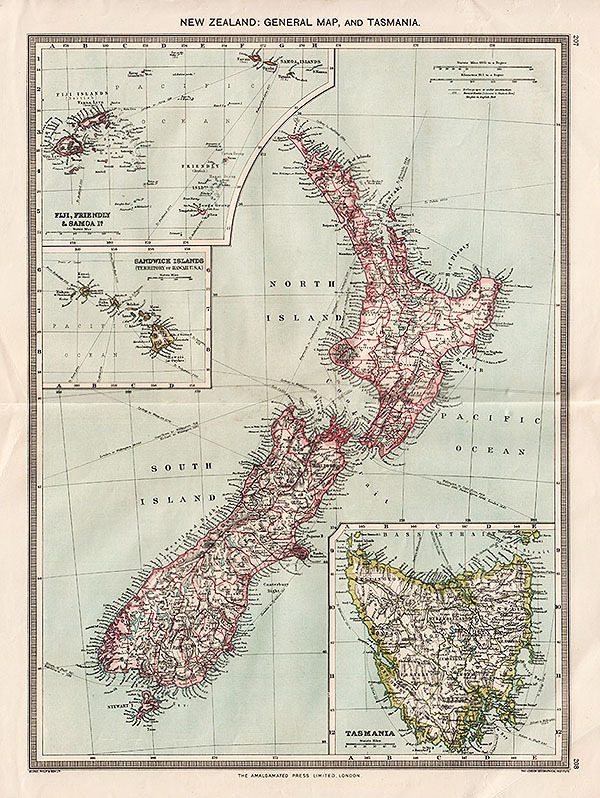 New Zealand: General Map, and Tasmania. Western Australia, showing the Goldfields - George Philip. 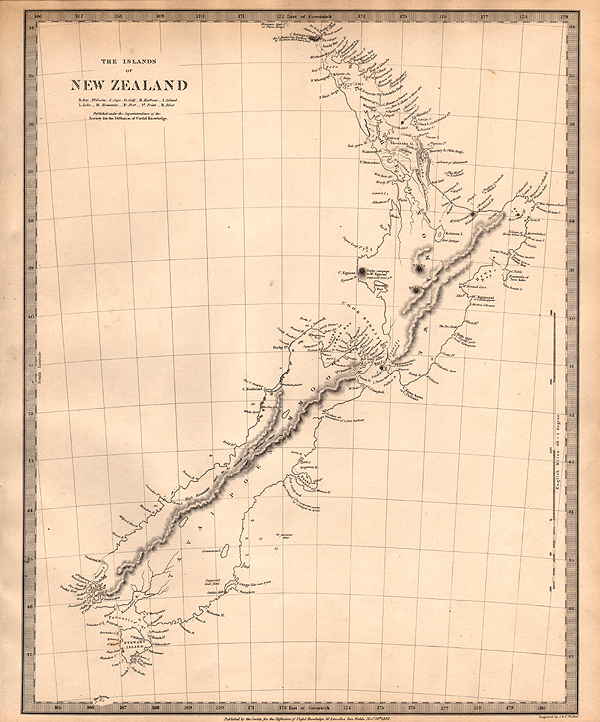 An antique map of The Islands of New Zealand engraved by J. & C. Walker. Published in "The History of England during the Thirty Years Peace: 1816 - 1846." by Charles Knight, 90, Fleet Street, London in 1849 with original outline colouring. This map was originally 'Published under the Superintendence of the Society for the Diffusion of Usefull Knowledge'. One horizontal and two vertical folds. Part of left vertical margin removed by bookbinder. Australia in 1846 - J. & C. Walker. 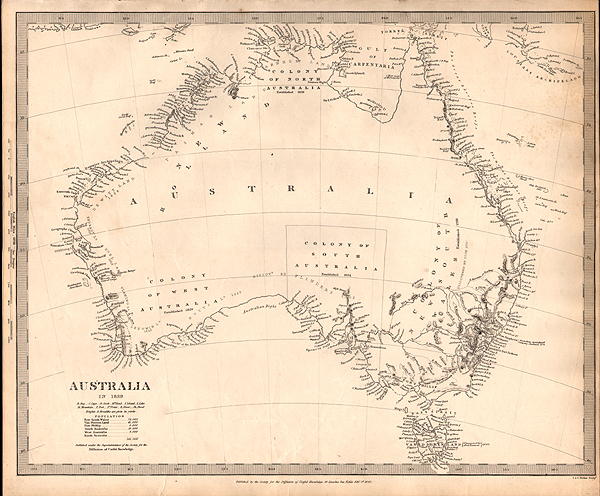 An antique map of Australia engraved by J. & C. Walker. Published in "The History of England during the Thirty Years Peace: 1816 - 1846." by Charles Knight, 90, Fleet Street, London in 1849 with original outline colouring. This map was originally 'Published under the Superintendence of the Society for the Diffusion of Usefull Knowledge'. One horizontal and two vertical folds. An antique map published by J.S. Virtue & Co. Limited. Circa 1880. Vertical centrefold as published. An antique map by F.S. Weller F.R.G.S. 'Published for the Proceedings of the Royal Geographical Society 1890'. Vertical fold as published. Inset map of 'North Coast of Guadalcanar'. 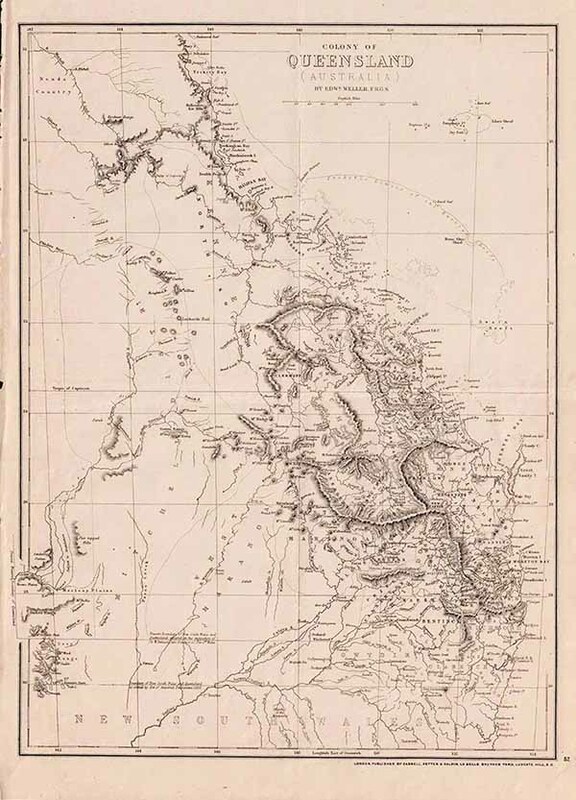 Map of the South Eastern part of New Guinea to illustrate the Explorations of Revd. J. Chalmers, L.M.S. 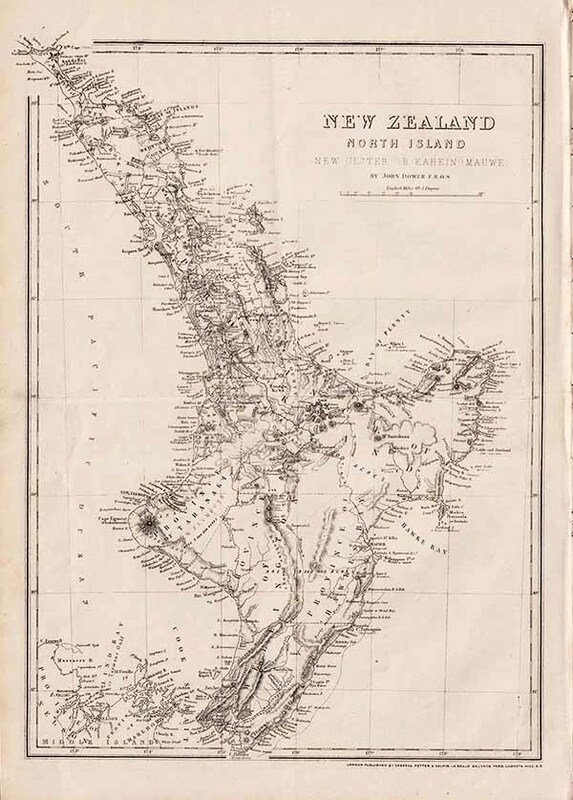 More Info An antique map "From the Proceedings of the Royal Geographical Society, 1887." Lithographed by Edward Weller. An antique map "From the Proceedings of the Royal Geographical Society, 1887." Lithographed by Edward Weller. Aaron Arrowsmith - New Holland. More Info An antique map drawn by Aaron Arrowsmith and engraved by Sidney Hall which is one of the earliest maps of Australia . Published by A. Constable & Co. Edinburgh in the first edition of Arrowsmith atlas published in 1817 with later hand colouring. No detail of the interior is present and New South Wales is the only territory mentioned. Van Diemen's Land is also shown. 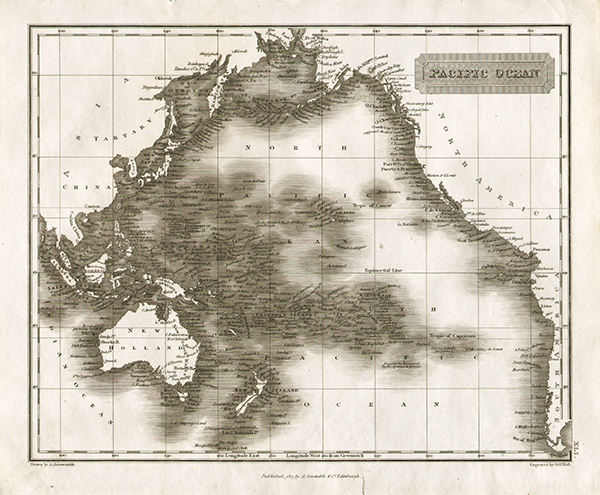 An antique map drawn by Aaron Arrowsmith and engraved by Sidney Hall which is one of the earliest maps of Australia . Published by A. Constable & Co. Edinburgh in the first edition of Arrowsmith atlas published in 1817 with later hand colouring. No detail of the interior is present and New South Wales is the only territory mentioned. Van Diemen's Land is also shown. Pacific Ocean - Aaron Arrowsmith. 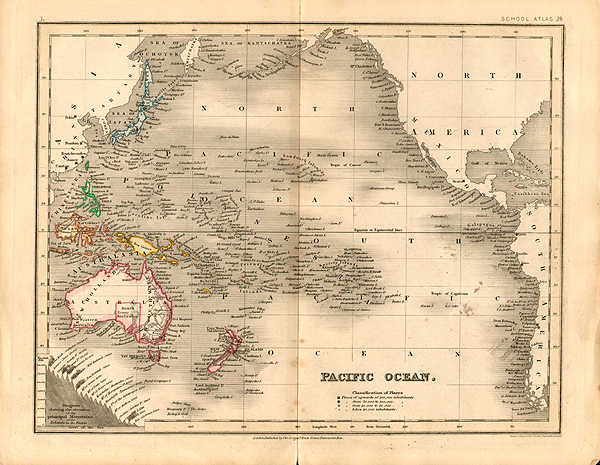 New Zealand - John Bartholomew & Co.
John Dower - Pacific Ocean. John Dower - Tasmania or Van Dieman's Land. John Dower - New Zealand. Polynesia or Islands in the Pacific. S.D.U.K. 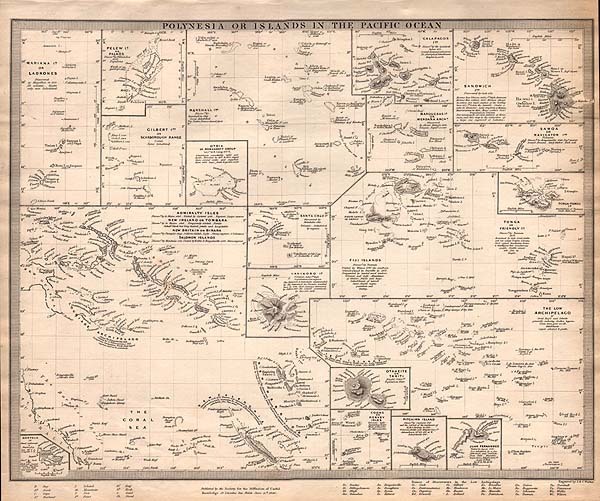 Antique map of Polynesia engraved by J. & C. Walker, published under the superintendance of the Society for the Diffusion of Useful Knowledge 59, Lincoln's Inn Fields, June 15th, 1840. 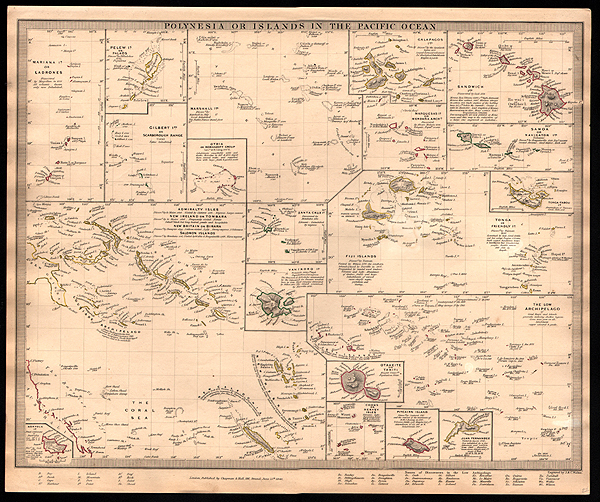 Shows numerous inset maps of the islands, each with great detail. One of the few maps available with details of even the tiniest islands. 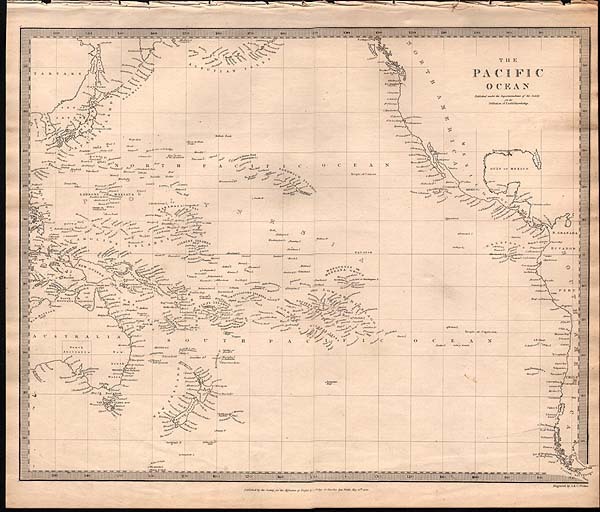 Antique map of The Pacific Ocean engraved by J. & C. Walker, published under the superintendance of the Society for the Diffusion of Useful Knowledge 59, Lincoln's Inn Fields, May 15th, 1840. Shows the islands through the Pacific. Depicts the whole coastline of North and South America and in Asia, the coasts of China, the Philippines and Australia. The Islands of New Zealand. S.D.U.K. An antique map of the islands with primarily coastal detail. Interesting notes about "High mountains said to be covered with perpetual snow" and "Supposed coal fields". Engraved by J & C Walker and ,Published by the Society for the Diffusion of Useful Knowledge , 59, Lincolns Inn Fields, Nov. 26th, 1838.' Towns, mountains, rivers, lakes are identified. 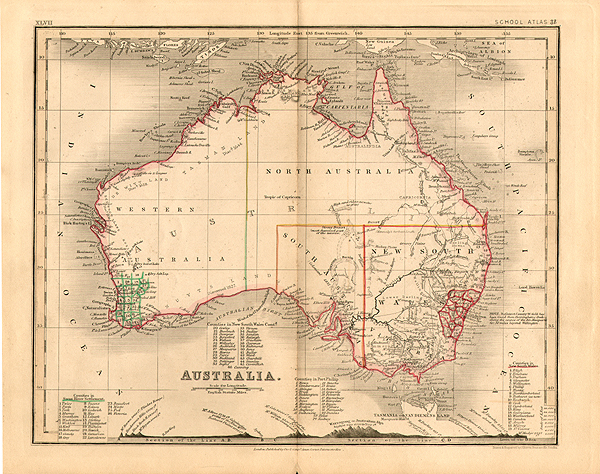 More Info An antique map of Australia with virtually blank interior. Major discoveries of Cook, Tasman and Flinders are identified. Each colony is named and notes the date of establishment, but none have their boundaries delineated save the "Colony of South Australia." Locates the small towns of Sydney, Adelaide, Perth, and Hobart on Tasmania, here Van Diemen Land. The only settlement in the vicinity of today's Melbourne is Cowie on the west side of Port Phillip near today's Geelong. Notation at Port Stephens: "Australian Agricultural Company, Chartered 1824." The population of the whole region is noted as 141,000. Published under the Superintendence of the Society for the Diffusion of Useful Knowledge 59, Lincoln's Inn Fields, Feb. 1st, 1840. Engraved by J. & C. Walker. 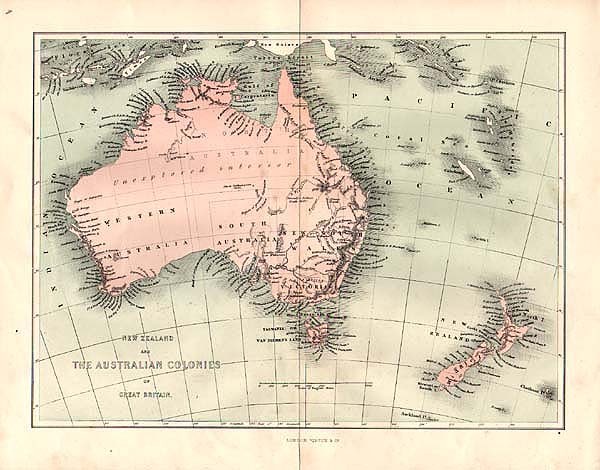 An antique map of Australia with virtually blank interior. Major discoveries of Cook, Tasman and Flinders are identified. Each colony is named and notes the date of establishment, but none have their boundaries delineated save the "Colony of South Australia." Locates the small towns of Sydney, Adelaide, Perth, and Hobart on Tasmania, here Van Diemen Land. The only settlement in the vicinity of today's Melbourne is Cowie on the west side of Port Phillip near today's Geelong. Notation at Port Stephens: "Australian Agricultural Company, Chartered 1824." The population of the whole region is noted as 141,000. Published under the Superintendence of the Society for the Diffusion of Useful Knowledge 59, Lincoln's Inn Fields, Feb. 1st, 1840. Engraved by J. & C. Walker. 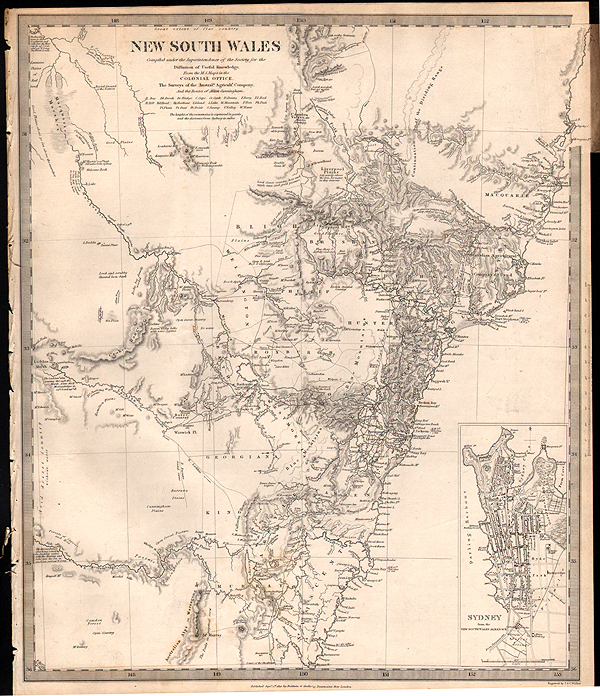 An antique map of New South Wales 'Compiled under the Superintendence of the Society for The Diffusion of Useful Knowledge, From the M.S. 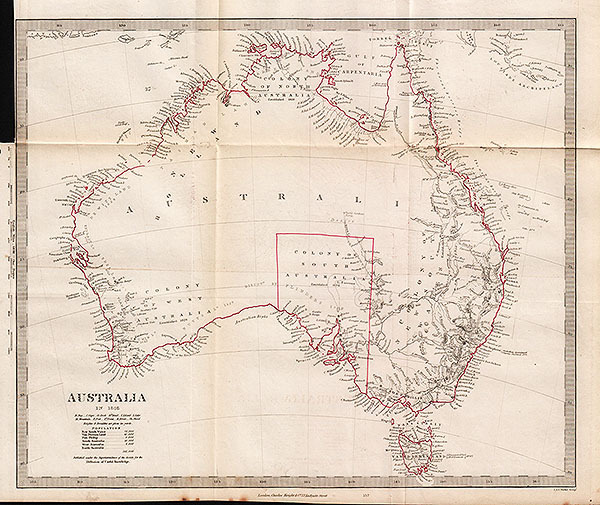 maps in the Colonial Office, the Surveys of the Australian Agricultural Company, and the Routes of Allan Cunningham' . Engraved by J & C Walker. Published September 1st 1833 by Baldwin and Cradock of 47, Paternoster Row, London. Large inset plan of "Sydney from the New South Wales Almanack"
Western Australia - Van Diemen Island. S.D.U.K. 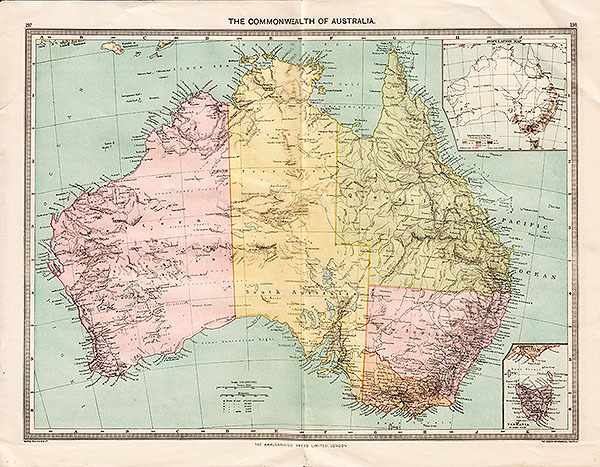 More Info Antique maps of Western Australia and Tasmania or Van Diemen's Land on one sheet. Published under the Superintendence of the Society for the Diffusion of Useful Knowledge by Baldwin & Cradock, 47, Paternoster Row, April 1st, 1833. Engraved by J & C Walker. The map of Western Australia shows from Melbourne south around Sussex to Stirling and Plantagenet and covers from Perth and the settlements along the Swan River, to St. George's Sound. Notes numerous counties, roadways, geographical features, and more. 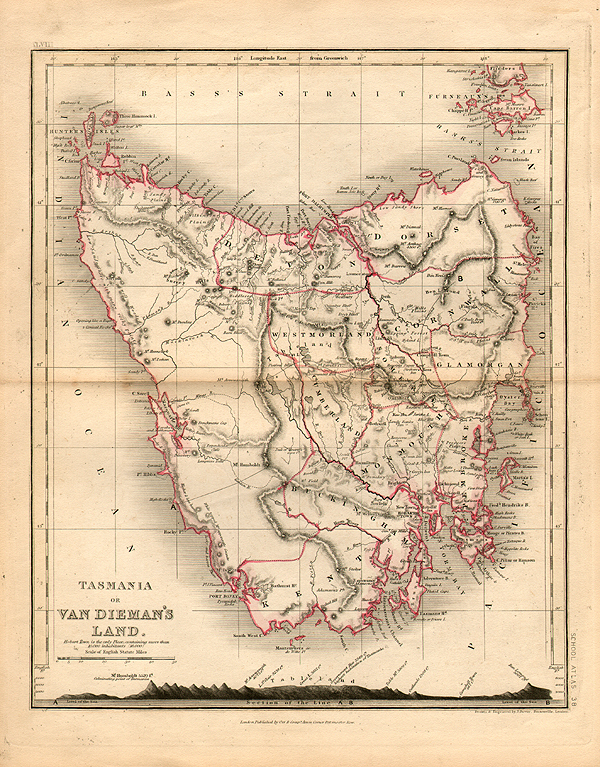 The right hand map is a large detail of Van Diemen's Island or Tasmania covers all of Tasmania and the Bass Strait. There is interesting detail of the sparsely settled regions. 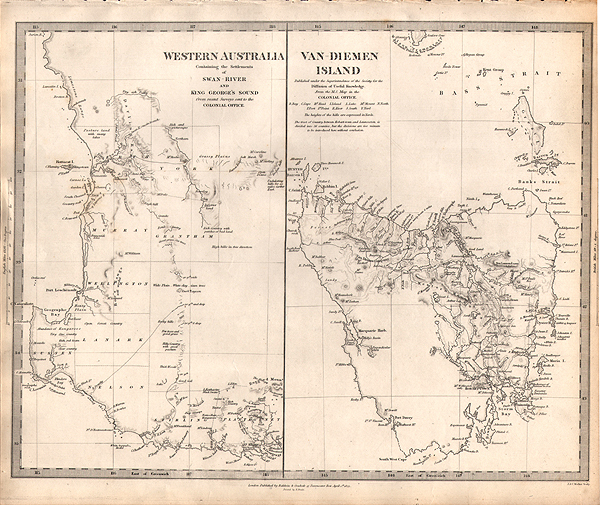 Antique maps of Western Australia and Tasmania or Van Diemen's Land on one sheet. Published under the Superintendence of the Society for the Diffusion of Useful Knowledge by Baldwin & Cradock, 47, Paternoster Row, April 1st, 1833. Engraved by J & C Walker. The map of Western Australia shows from Melbourne south around Sussex to Stirling and Plantagenet and covers from Perth and the settlements along the Swan River, to St. George's Sound. Notes numerous counties, roadways, geographical features, and more. 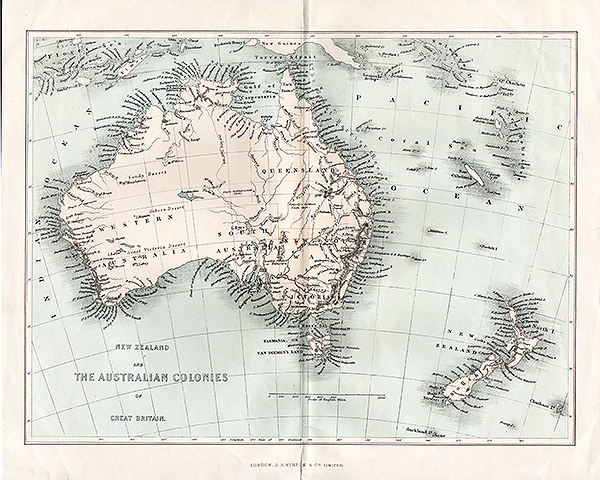 The right hand map is a large detail of Van Diemen's Island or Tasmania covers all of Tasmania and the Bass Strait. There is interesting detail of the sparsely settled regions. New Zealand and the Australian colonies of Great Britain. 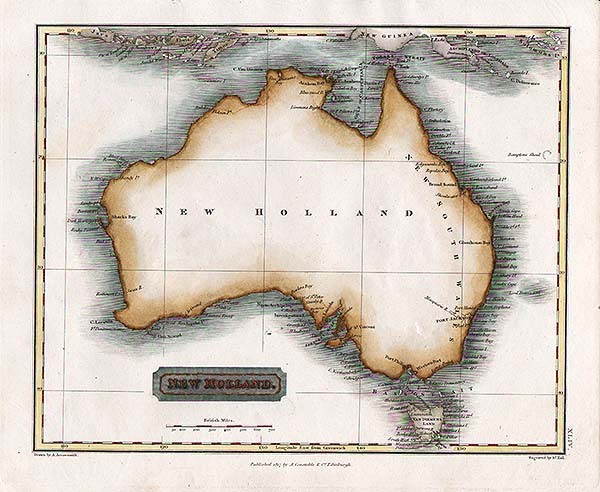 A tinted lithographic map of Australia & New Zealand, with much of the Australian interior marked 'unexplored', although the extents of the treks of Sturtin 1845 and Kennedy in 1847 are shown. Published London : Virtue & Co., Circa 1855. Polynesia or Islands in the Pacific Ocean. S.D.U.K. More Info Polynesia or Islands in the Pacific Ocean. Mariana Is. or Ladrones. Pelew Is. or Palaos. Gilbert Ids. or Scarborough Range. Marshall Ids. Otdia or Romanzoff Group. Galapagos Ids. Marquesas Is. or Mendana Archo. Sandwich Ids. Samoa or Navigator Ids. Tonga or Friendly Is. Tonga-Tabou Id. Santa Cruz Is. Vanikoro Id. Admiralty Isles, New Ireland or Tombara, New Britain or Birara, Salomon (sic) Islands. Norfolk Id. The Low Archipelago (Society Islands), Otaheite or Tahiti. Cooks or Hervey Isles. Pitcairn Island. Juan Fernandez. (Published under the superintendence of the Society for the Diffusion of Useful Knowledge). Engraved by J. & C. Walker. London, published by Chapman & Hall, 186, Strand, June 15th. 1840. Polynesia or Islands in the Pacific Ocean. Mariana Is. or Ladrones. Pelew Is. or Palaos. Gilbert Ids. or Scarborough Range. Marshall Ids. Otdia or Romanzoff Group. Galapagos Ids. Marquesas Is. or Mendana Archo. Sandwich Ids. Samoa or Navigator Ids. Tonga or Friendly Is. Tonga-Tabou Id. Santa Cruz Is. Vanikoro Id. 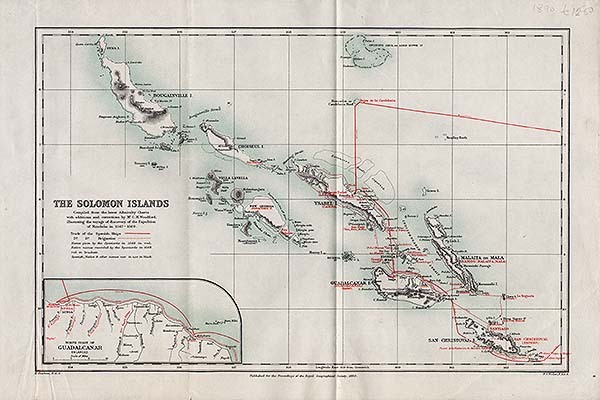 Admiralty Isles, New Ireland or Tombara, New Britain or Birara, Salomon (sic) Islands. Norfolk Id. The Low Archipelago (Society Islands), Otaheite or Tahiti. Cooks or Hervey Isles. Pitcairn Island. Juan Fernandez. (Published under the superintendence of the Society for the Diffusion of Useful Knowledge). Engraved by J. & C. Walker. London, published by Chapman & Hall, 186, Strand, June 15th. 1840. Western Australia Containing the Settlements of Swan River and King George Sound / Van-Diemen Island. S.D.U.K. 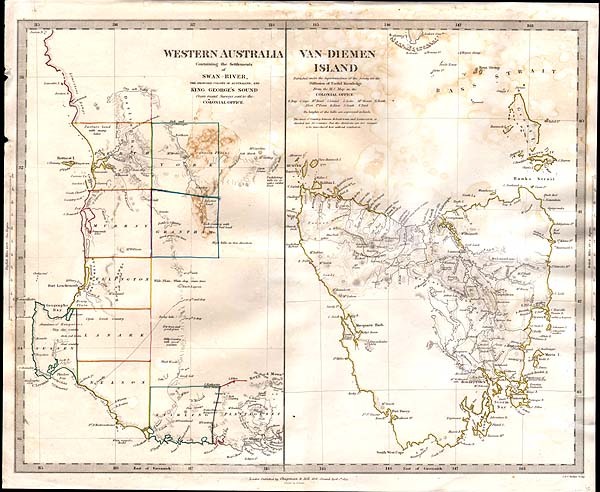 More Info An antique two part map of Western Australia Containing the Settlements of Swan River and King George Sound and Van-Diemen Island. Western Australia covers from Perth and the settlements along the Swan River, to St. George's Sound. The other half covers all of Tasmania and the Bass Strait. Engraved by J & C Walker, for the Society for the Diffusion of Useful Knowledge. Published April 1st, 1833. Overall brown staining. Repaired split on verso. An antique two part map of Western Australia Containing the Settlements of Swan River and King George Sound and Van-Diemen Island. Western Australia covers from Perth and the settlements along the Swan River, to St. George's Sound. The other half covers all of Tasmania and the Bass Strait. Engraved by J & C Walker, for the Society for the Diffusion of Useful Knowledge. Published April 1st, 1833. Overall brown staining. Repaired split on verso. 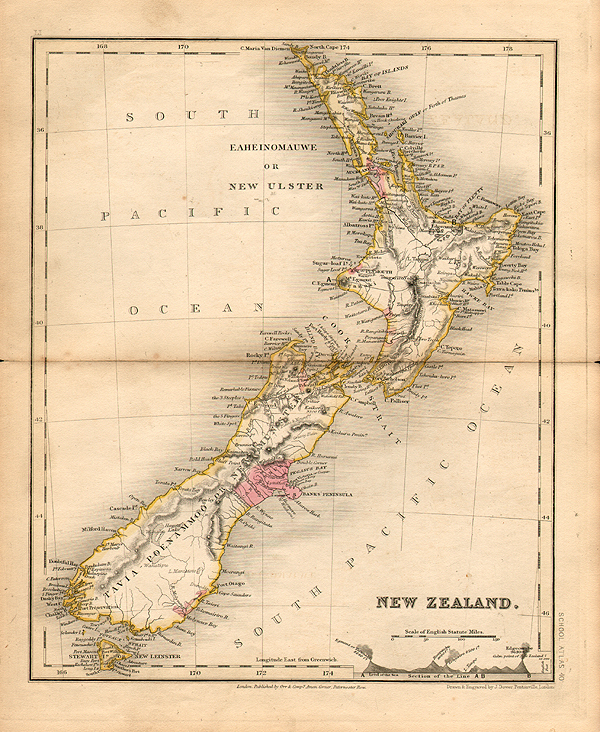 An antique map of New Zealand published by George Philip & Son. Liverpool . Circa 1856. Note on discovery, population, (colonists: 11,948; Aborigines estimated 110,000) and distance to Hobart. ; Plate "34". Inset: New settlement of Canterbury.